This is the second of a series of blog posts highlighting the ongoing work of the Documenting UO History Project within the University Archives. A major part of this project is researching and documenting the often untold and hidden histories of the university’s diverse and underrepresented communities. This year our focus will continue to focus on Black history on campus, specifically Black student activism from the 1960s to present. Prior posts can be seen here. 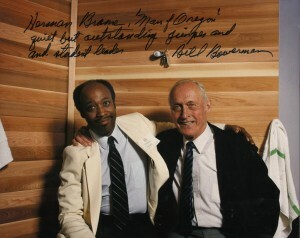 Herman Brame and Bill Bowerman, ca. 1980s, photo courtesy of Herman Brame. Last year, the UO Black Student Task Force released a list a list of 12 demands to the university administration — the demands included the immediate renaming of campus buildings, efforts to increase the black student population and an increase in black faculty. The demands were strikingly similar to the list of demands and grievances offered by the University of Oregon Black Student Union in 1968 — many of which have been echoed on campus for decades. A strong African studies program has been another area where the university seems to lag behind counterparts in Portland and other west coast universities. Many black students say there is general feeling of exclusion on campus and in the community. This is a century-old dilemma plaguing minority groups throughout Eugene and Springfield – something that both lists addressed and that has come to the forefront recently on campus. This post highlights some of those recent activities and our current outreach with UO alumni on this topic. Community Rally, hosted by black student organizations, November 11, 2016, photo by Joseph Foley. 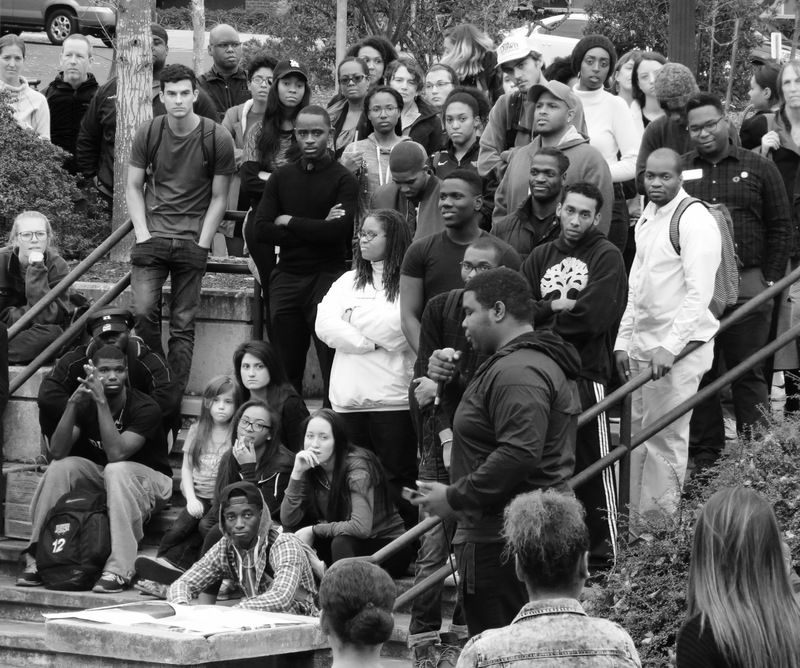 On November 11, 2016, the Black Student Union and the Black Student Task Force held a rally at the Erb Memorial Union courtyard to address the climate around race on campus. Just days before the rally, high school students were seen wearing blackface on campus, a law professor at University of Oregon wore blackface to a Halloween party and protests had been erupting nationally regarding the recent presidential election — all of which added a great deal of emotion to the event. The rally also marked the one-year anniversary of the day the Black Student Task Force delivered President Schill and the administration the list of demands. President Schill addressed the crowd of students and staff and expressed support of the event. Speakers held Schill to task, pointing out the fact that their list of demands from 2015 had only been partially completed — emblematic of the racism they face daily. The speeches and performances were impactful and heartfelt. Many of those involved as well as those in attendance were in tears. In lieu of more violent protests after the presidential election, the rally set a positive example of how a protest or gathering could be conducted peacefully. It is vital that as a campus community we recognize our historic and current deficiencies regarding race and make significant changes. Hearing stories from black activists and community members is an essential part of understanding the historical and prevailing dilemma of black student exclusion on campus. 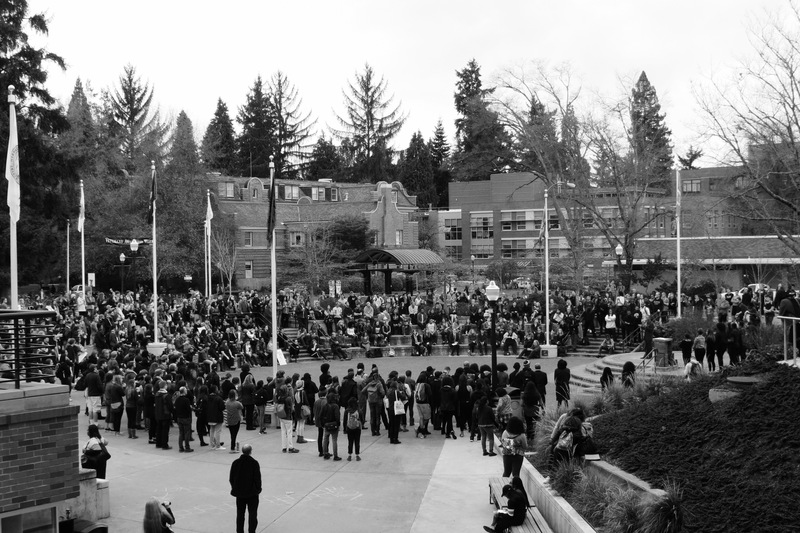 Black student activism has played an impactful role on the Oregon campus for decades. Highlighting the courageous battle that students and faculty have fought and continue to fight for, ensures equality is an incredibly important part of Oregon history. Yet, it is a history that remains, for the most part, untold. Thus, as part of the Documenting UO History Project we are reaching out to past alumni and current students to tell these stories. While researching the University of Oregon’s pioneering African American female students for a research paper last year, I came into contact with UO alum Herman Brame. He graduated from the University of Oregon in 1968 and was a member of the Black Student Union. He came to Oregon as a student first, but competed in track and field after Coach Bill Bowerman recruited him. Brame began researching black history at the UO after he retired, but was disappointed to find that there was very little documentation covering the topic. Despite his initial disappointment, Brame took it upon himself to begin filling the holes. In a recent interview with him for this project he said, “Although I was disappointed – I had to hold myself accountable. It was my obligation to take action as well as the entire black community to begin to piece together African American history at the UO”. That is exactly what Brame did. He produced summaries of all aspects of UO black history, all contributed to Special Collections and University Archives. Brame’s tireless efforts have single-handedly created the most extensive summary of black student history that the University of Oregon currently holds (see his various publications and research highlighted on our blog). In our interview, I asked Mr. Brame if he was surprised that the 1968 list from BSU was similar to the list released in 2015. He said absolutely not, and then referenced Corvallis, which has been stereotyped as a rural and somewhat racist community compared to Eugene, yet Oregon State University is leading the way in regard to supporting black and Latino populations within their campus — with projects like the Latinx Oral History Archives and a building renaming process. For UO to make positive progress, Brame believes that it will require unwavering support from UO administration coupled with the support of the entire community. Our next blog posts will include more information from our interview with Herman Brame — and newly accessed information from former University of Oregon President Arthur S. Flemming’s records. Each month new blog posts will include recent findings as part of the the overall project and research. This is a very collaborative and open project so we welcome all participation and topic suggestions. This project will only be successful with a diverse community of scholars and students working together to find and document these testimonies. If you or anyone you know is interested in contributing to the process or participating in an oral history interview please contact us. Photos by Herman Brame and Joseph Foley. Brame, Herman. “Herman Brame, 1968 UO Graduate & Founding BSU Member.” Interview. University of Oregon Special Collections and University Archives, November 1, 2016. The Daily Emerald. “Black Student Task Force: 12 Demands – One Year Later – Emerald Media.” Emerald Media. 2016. President Schill. “Moving Foward Together”. November 7, 2016. “University of Oregon Law Professor Who Wore Blackface Issues Apology.” The Root. 2016. This is amazing! Thank you Joseph for you work on this? I am interested in learning more history about black UO alumni. Would you be interested in connecting? Anetra, thank you so much. This has been a wonderful project and similar to other research I have done here at Oregon. Last year I focused on the University of Oregon’s pioneering African American female students. Please feel free to email me at jfoley4@uoregon.edu. I’m looking forward to connecting. Thanks for reaching out.